Enamel is powdered glass on copper or silver that when fired with a torch or kiln at high temperatures becomes a hard layer of glass. There are many colors - opaque and clear and they can be layered to create different effects. The process requires many steps and is quite time consuming. Each piece is a unique one of a kind piece of wearable art! 20" long with gorgeous garnet colored Czech crystal flower beads and black jet crystals. Czech "shape" crystal beads are all hand made small batch production. Enamel Heart is hand cut and uniquely colored due to the firing process. Heart hangs 1" down and is 1" across. Silver plated toggle clasp. 19 1/2" long Czech faceted crystal and small batch etched blue flower necklace with 1" hand cut and shaped Enamel Flower Pendant. Pendant has a mille fiore bead melted to the center. Silver plated flower hook clasp. 18 1/2" long with silver plated toggle clasp. Czech crystals in a unique denim blue. Lighter blue crystals create an ombre effect. 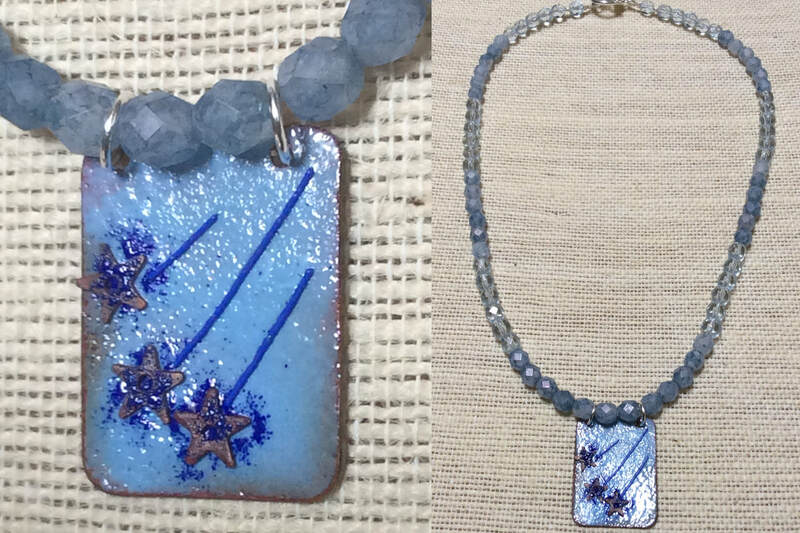 1" Enamel Shooting Stars pendant uses glass "stringers" to create the trail for the copper stars. 19 1/2" long green jade stones and various Czech faceted crystal beads. Enamel Leaf is hand cut and shaped and adorned with a glass stringer and a copper butterfly. 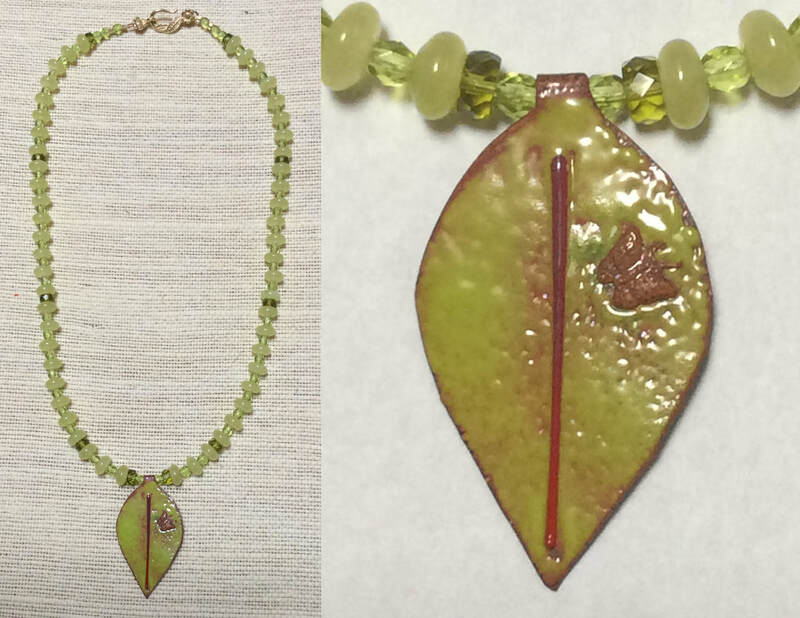 Leaf pendant is 1 3/4" long. Gold plated flower hook clasp. 19" long necklace with turquoise blue glass beads in various shapes. Enamel Pendant is hand cut and shaped and fired with several layers. Pendant is approx. 1" long. Earrings are also hand cut, shaped and enameled in several layers to create the unique color effect - 1" long. Silver plated ear wires and toggle clasp. 19 1/2" long necklace with unique blue and white hand made Czech crystal beads. 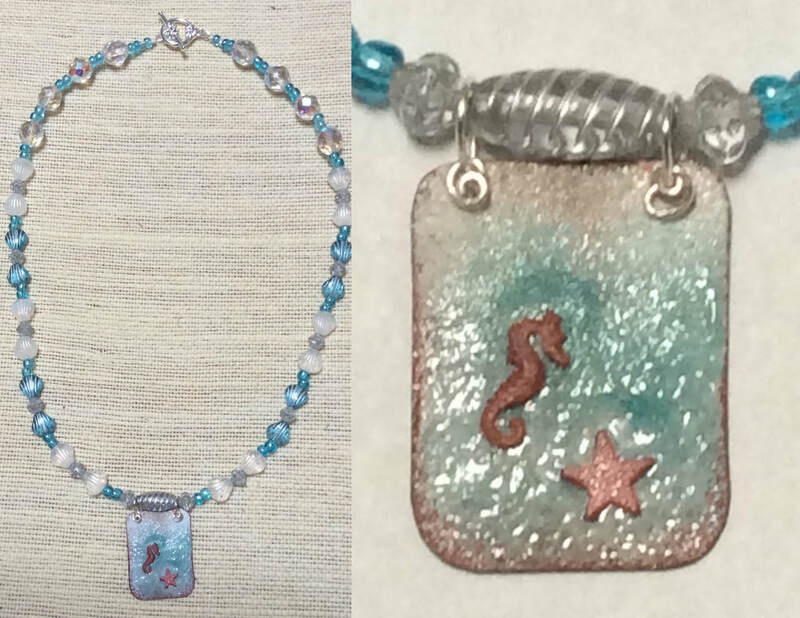 Enamel pendant is hand cut, shaped and fired with multiple layers of enamel for a gorgeous under sea effect and then accented with copper sea horse and starfish. Pendant is 1" long. Silver plated toggle clasp. 18 " Sterling Silver Box Chain with a Enamel domed center teal flower pendant and matching Earrings. Each flower has 3 different enameled pieces - the flower, the domed center, and the center head pin which joins the pieces together. Each Flower is 5/8" .Earrings have silver plated ear wires. 19" long with beautiful variety of green Czech faceted crystal beads. Enamel Pendant is hand cut and shaped. Color of copper flowers has been created with torch fire and enamel. Flower stems are glass stringers. Gold plated flower toggle clasp. Enamel is powdered glass on copper or silver heated to high temperatures which creates layers of solid glass. Each piece is done individually and takes multiple steps. Each Flower consists of 3 separate enamel pieces to include a hand domed center and a hand made head pin used to attach the pieces together. Silver plated ear wires. Flowers hang 5/8"
These are a perfect match to the Blue Flower Enamel Necklace! 17" long with purple glass cube beads and shimmery purple and clear glass spacers. Purple Enamel Heart is hand cut and shaped and then domed for added dimension. Heart hangs 1 1/2" and is 1 1/4" wide. Silver plated toggle clasp. 18" Sterling silver box chain. Pink Enamel Heart is hand cut and shaped then domed to create the perfect spot for the authentic sea glass pebble center. Sea glass is from a past trip to the Italian Island of Capri. Heart is 5/8"
19" long Black Czech glass flower beads and jet crystals. Flower beads are hand made in small batches. Red Enamel heart is hand cut and shaped and then domed for dimension. Silver plated toggle clasp.